Flavorful and healthy, these versatile beans can enliven a variety of dishes. 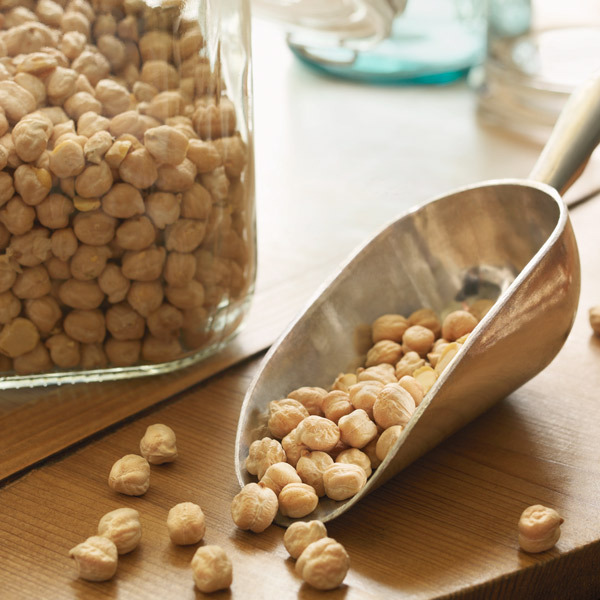 And with more than 6 grams of fiber per serving, chickpeas are slow to digest, which means you’ll stay nicely full while your body gets a long-lasting, steady stream of energy. Fuel up for fall with one of these chickpea recipes: Spicy Indian-Style Hummus, Chicken & Chickpea Stew, Vegetarian Chili and Arugula Salad with Chickpeas, Roasted Peppers and Feta. Garlic, fresh ginger, garam masala and turmeric add a spicy flair of flavors to this Indian-style hummus recipe. This hearty stew combines canned chickpeas with chicken, chorizos, cilantro and corn for a fast and filling meal the whole family will enjoy. This rich vegetarian chili recipe features cashews, broccoli, tomatoes and chickpeas. A dash of cocoa powder adds a tasty twist. A simple lemon juice and olive oil dressing melds the fresh flavors of this tossed arugula and chickpea salad. Chickpeas, first cultivated around 4000 BC in the area that is modern-day Iraq, are among the earliest crops. They are legumes, large relatives of the garden pea, and are available in two main varieties: kabuli (big and beige) and desi (small and dark with a yellow interior). In US markets, you’ll usually find kabuli, labeled simply “chickpeas” or “garbanzos” (their Spanish name). Though canned chickpeas are fine for most recipes (they don’t get mushy the way other canned beans do), cooking dried chickpeas from scratch allows you to control the sodium level. Soak them for several hours or overnight. Drain, add fresh water to cover by 2 inches, and cook until tender, 1½ to 2 hours (depending on how long the beans were soaked). A ½ cup serving of cooked chickpeas has 35 percent of the RDA for the B vitamin folate and 30 percent of the RDA for iron (eat them with vitamin C–rich food, like tomatoes, to enhance iron absorption). Each of the four major legumes consumed in ancient Rome—fava beans, peas, lentils and chickpeas—gave its name to a prominent Roman family. The Ciceros (their name derived from the Latin word for chickpeas) are probably the most notable. Hummus, the Middle Eastern pureed chickpea-and-tahini spread, gets its name from the Arabic word for chickpeas.